If you want to identify a Bengali in a group, apart from being loud, just call out 'Posto' and they will turn around with hungry eyes. Posto basically is poppy seeds (yes, readily available all over India). A brilliant constituent of Bengali cuisine. Use the seeds in a batter for fried potatoes, make a paste of the seeds and use it as a base to many of the Mughlai sauces and vegetable curries or just mix the paste with mustard oil, green chillies, onion slices and salt .... Yummm! Although some might say that this love of bongs for posto is a myth and to be honest I know a couple of people who are not-so-fan of it. However, I guess once you leave home, you miss it. So, today my mom made Alu-Posto (Potato curry with poppy seed paste) and immediately I knew what is going to be my first recipe. After all this in-depth information, you must be sure I belong to the "I can Kill for Posto" category. And trust me, as much as you think you can never recreate your mother-grandmother's magic in kitchen, this recipe is not that difficult. Also, poppy seed paste has such a versatile character that this recipe can have several variations, whichever way you like it. I will first write the simple recipe for Alu-posto and at the end of the post will give you the variations possible according to me, at least the ones I know. So, for 2 people, get 2 big sized potatoes. Wash them properly. You can peel off the skin or if you are in India and you get new season potatoes, just leave the skin on. Cut them into small pieces and soak them in water. Now for poppy seeds, easily available in India all around however, was a bit difficult and expensive to find in Europe. But Asian shops are life savers and you can get them. For this recipe you need a paste of poppy seeds. When I went back to Europe after my vacations for the first time I had carried dry-grounded poppy seeds sealed it an air-tight pack. I used it for almost a year. If you are doing fresh, grind with a bit of salt and a green chilli. If using from powdered, mix the powder with warm water and a bit of salt. In a pan heat some oil, does not need to be a lot, preferably mustard. Add potatoes and a slit green chilli and salt (remember you have salt in poppy paste as well). Fry the potatoes till they are almost done. If you think, add a bit of water and cover the pan for the potatoes to boil n become soft. Once done add the poppy seed paste and mix well. Well, that's it. We have Alu-Posto ready! 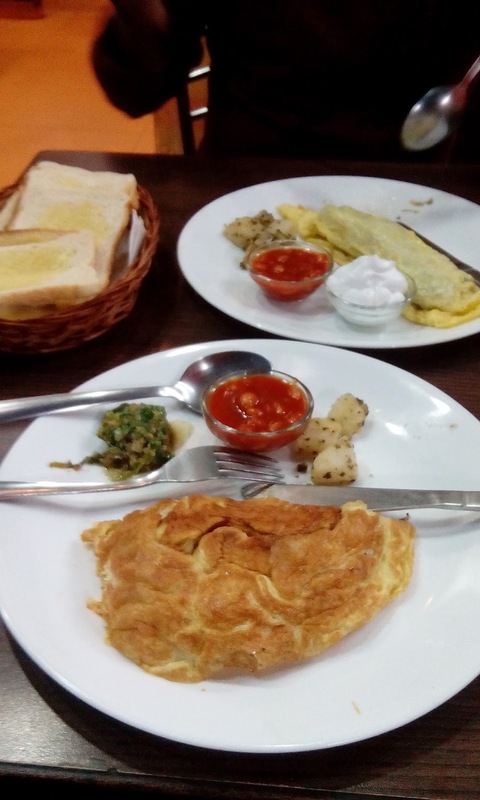 So now the variants of this dish. You can add onions along with potatoes and/or tomatoes. You can also replace potatoes with just onions and tomatoes, one of my favorites. You can also add other green veggies (potol, okra, zucchini, aubergines, boiled eggs!) with or without potatoes. You may have to just change the recipe a bit according to the ingredients used. So, as you can understand why I said, 'posto has a versatile character'! Hope this recipe helps as well as the tips and tricks I have jotted down here. 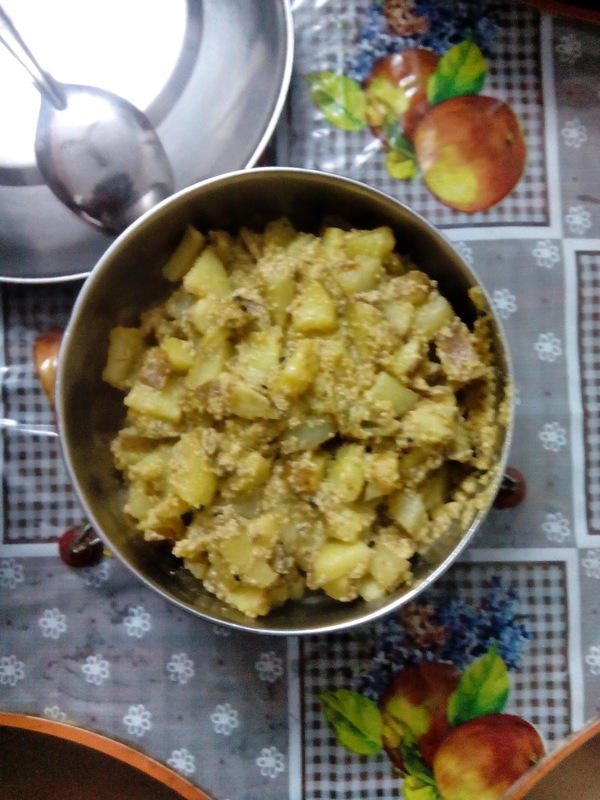 Here is a picture of Alu-Posto my mom cooked today with new season potatoes. Hope everyone is enjoying this holiday season. Family, food and laziness; that’s all we want for holidays. So, I have been thinking about blogging for quite some time, but never got into it, although I have made my girlfriend write a blog on books. Since these days I am looking for something new to do in life, why not start blogging. And why not on food and cooking, my favorite hobbies. Most of the foodies claim that they live to eat, I basically ‘live to eat a variety of food and love to recreate them’. And since by profession I am a scientist, experimenting is what I do in and out of my laboratory. Here I would like to confess, laboratory for me does not only mean the workspace in my research institute but also my kitchen (I still don’t own one though). Therefore, watch out for this space to know my kitchen experiments. I will share recipes collected from around the world, tested and tried and maybe tweaked a bit. Changes in recipes will be done keeping in mind a ‘bachelor’s kitchen’. Well so lets see how all of this goes. Good luck to me for not burning down kitchens and good luck to all who would like to try them out. And definitely let me know your opinions.